Eighteen brief stories inspired by television commercials produced by America's favorite brands. What if actual human beings lived in the worlds created by brand marketers? A Taco Bell test kitchen is pushed to its limits. A new Lexus for Christmas takes a family over the edge. An exceptional outing with extremely beautiful people becomes transcendent when onion cheeseburgers get passed around. Budweiser, Cialis, Toyota and KFC are a few of the other branded worlds explored here, where everyday lives are shaped by human needs as much as marketing strategy. 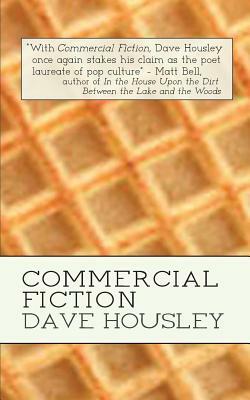 "With Commercial Fiction, Dave Housley once again stakes his claim as the poet laureate of pop culture. No one else could take the cynical manipulations of commercials and extract from them so much humor and empathy and heart." - Matt Bell, author of In the House upon the Dirt between the Lake and the Woods.